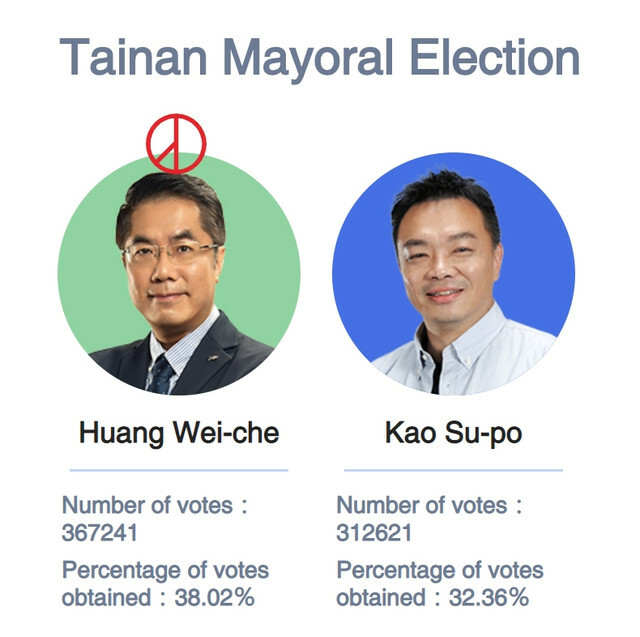 Taipei, Nov. 24 (CNA) The ruling Democratic Progressive Party's (DPP's) Huang Wei-che (黃偉哲) declared victory in the Tainan mayoral election Saturday, defeating his closest rival, former Kuomintang (KMT) legislator Kao Su-po (高思博). Huang garnered 360,749 votes or 38.01 percent of the total of votes casted in a six-way race, ahead of Kao who got 307,725 votes or 32.43 percent, after more than 98 percent of the total number of ballots counted. Huang's win means the DPP will continue its 25-year hold on the mayoral seat in the southern municipality. Huang won the party's primary against five other hopefuls earlier in the year. Tainan has been headed by Acting Mayor Lee Meng-yen (李孟諺) for the past year, since former Mayor Lai Ching-te (賴清德) was appointed premier in September 2017. The other candidates in Saturday's six-way race were four independents, namely former Tainan county magistrate Su Huan-chih (蘇煥智), who gave up his DPP membership in March after 27 years to run as an independent, former Taiwan Solidarity Union legislator Hsu Chung-hsin (許忠信), Lin Yi-feng (林義豐) and Chen Yung-ho (陳永和). The southern city has a total of 1,546,862 eligible voters. In his victory speech, Huang said although he won the election, his margin of victory was small compared with his predecessor Lai, who won by a landslide in 2000 and 2014. Huang also said that the DPP's lackluster performance in the local elections Saturday indicated that there is a lot of room for improvement. He said he will continue to humbly advance reforms in Tainan, drawing on the proposals put forth by the other mayoral candidates in the city. "My election is a heavy responsibility on my shoulders," Huang said, adding that he did not do enough to help his party in the nationwide local government elections. Commentators have ascribed the DPP's landslide defeat in Saturday's elections mainly to a weak performance by the central government and the popularity of the KMT's Kaohsiung mayoral candidate Han Kuo-yu (韓國瑜), who is said to have created a "Han Wave" that helped galvanize support for other KMT candidates across the country.